Lying peacefully on the bottom not far from the mouth of Quartermaster harbor lies an old wood hulled wreck that was abandoned here about 40 years ago. The deck house is missing, but the outline on the deck shows it was once rounded in the front, dating the design of this 60' fishing boat to a much earlier design. The old motor sits headless and rusting away, but a newer motor lies near the compressors, still bearing the slings that were used to lift it aboard. The rudder points straight ahead, just aft of the now quiet propeller, while pregnant rockfish hover in the holds of this old wreck. Light currents and good visibility make this a very pleasant dive, with many curious rockfish and numerous nudibranchs and sea stars slowly moving amongst the large orange and white anemones. The white painted sides, red bottom and grey blue trim still make a futile attempt to protect the wood from the elements. It is a losing battle, but the remains are in remarkable shape for a vessel this old. No fishing lures are found on this wreck, leading me to believe that it's location was long ago forgotten, after the old tug was abandoned some 30-40 years ago. 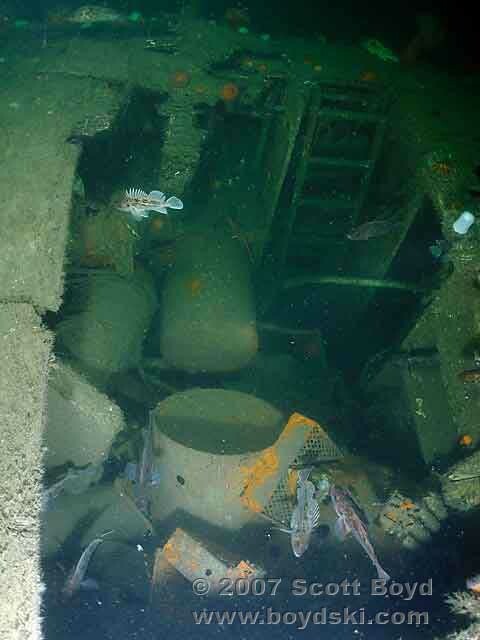 At only 70' of depth, this is an easy wreck, and makes a great second dive after KVI or Dalco. 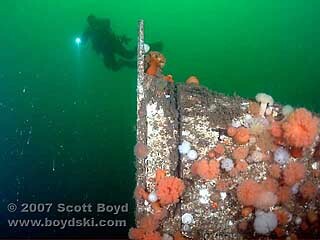 For more information on diving this interesting old wreck, including the gps coordinates, please see Northwest Wreck Dives.